Presentation folders are a great way to present marketing proposals, product descriptions, collateral materials and corporate information. Perfect for seminars or business event to give out business information or to present catalogues. 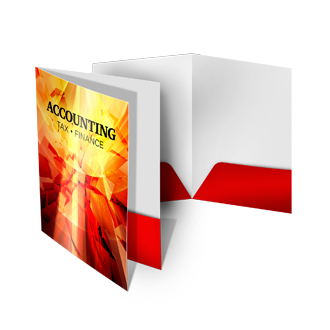 There are many variations of presentation folders such as certificate folders, pocket folders, tripanel folders, triple pocket folders, landscape folders. A5 and A4 size folders are most widely used , but some organisations also use elegant tri-panel folders. The pockets are made to hold other stationary material e.g. business cards, CD’s or brochures. Making a good impression is important for your business. You want people to see you as trustworthy and credible. A presentation folder is a simple marketing tool that lets you make a presentation in style. Quality materials and finishes to ensure your folders are stylish and impressive. Folders can be printed either in full colour or black and white. You can customise the colours on the inside and outside of the folder. The number of pockets, business card slits and other jackets can also be customised. We offer special effects such as foil stamping, clear, silver or gold printing, Spot UV and embossing or raised words on presentation folders. Ask us about any customisation that you need or have in mind. Agility Print is a corporate printing company offering high quality printing of presentation folders at affordable prices. You can either provide your own design or you can get your presentation folders designed by our talented and creative designers. If you have any question about ordering or customisation, give us a call! DO YOU HAVE A QUERY REGARDING PRESENTATION FOLDERS?